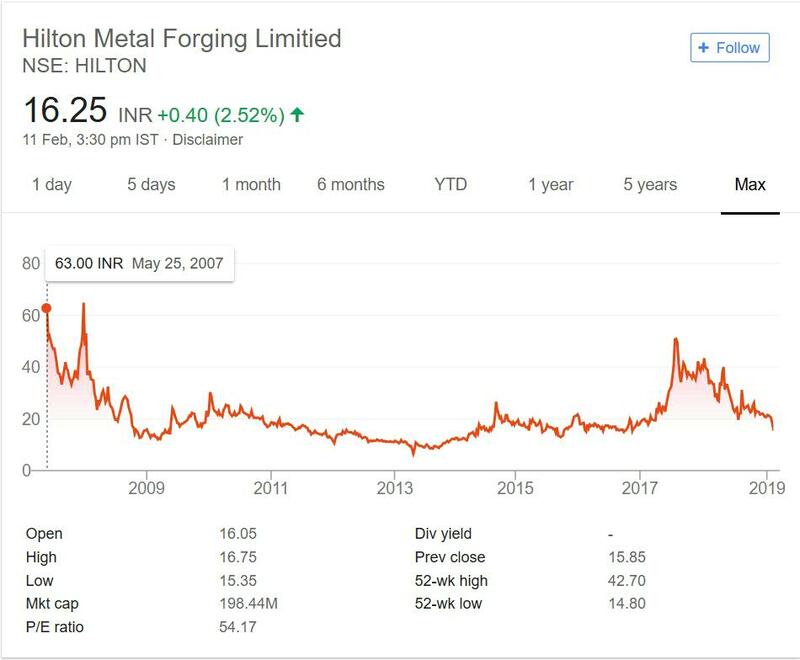 Hilton Metal Forging Ltd. is in portfolio of Subramanian P. He is one of the top investors in India. It is a Forging sector Company. There are not many companies listed in this space. As per the Company website it is manufacturer & distributors of steel forged flanges, fittings & oilfield and marine products for both the domestic & international markets as per ASTM/ ASME/MSS/API/AWWA/DIN/EN/ AUSTRALIAN/RUSSIAN AND NACE Standards. The Flanges are of many types like Stainless steel flanges, High pressure flanges, Threaded flanges, Blind flanges, Weld neck flanges and Socket welded flanges. The manufacturing plant is situated in Palghar Maharastra. The office is situated in Mumbai Maharastra. The Company is relatively new compared to other established players listed in India. The company got listed in year 2007 at 63 INR mark. This was not good time to get listed due to 2008 global crisis. Due to the crisis company went below 20 mark. So far in past 11 years it has not managed to top the listing price. This is very saddening for investors of the Company. It made high of 50 in recent bull run but again slipped back to 15 odd mark. As mentioned above you can count the number of companies listed under Forging category on Stock Exchanges. There are not many companies in this segment. Bharat Forge being the largest player in this segment. I would rather go with established players in this sector if at all I have to invest in Forging sector. There are two reasons it is business oriented sector. You are serving the Industries rather than individual customers.